Throughout his three-year career on the Stony Brook men’s soccer team, senior defender Danny Espinoza has been called a defender, a veteran and a leader by teammates and coaches. After Friday’s game against Seton Hall, another label can be added to his resume: goal-scorer. 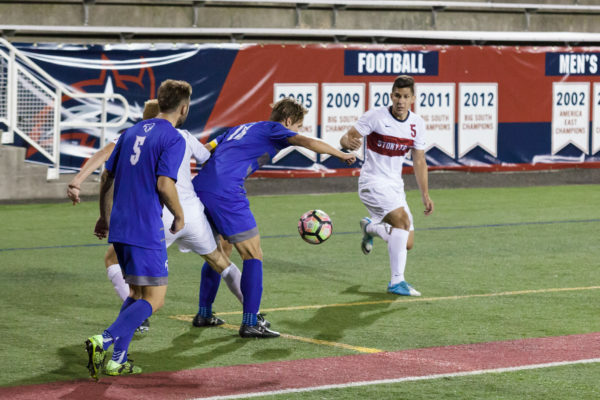 The senior’s first collegiate goal in his final year with the Seawolves was the deciding factor in the game, as the team went on to take down the Pirates 1-0 at Kenneth P. LaValle Stadium Friday night. Espinoza’s goal came with just over 30 minutes left in the second half, and it almost did not come to fruition. Senior forward Akeem Morris beat his defender and took a shot from inside the 18-yard box that deflected off the crossbar and was cleared out by a Seton Hall defender. Espinoza found the clearance and drove the ball into the back of the net from 25 yards out. However, that was not his intention. The first half swayed back and forth for both teams, culminating in a stalemate of 0-0 at halftime. The Pirates, however, were the more offensive team of the two. They were creating more chances in the first half, almost taking the lead on a header from Pirates redshirt sophomore Corey Burkhardt. But the shot was saved by redshirt senior goalkeeper Tom McMahon in the 10th minute. In the second half of play, Stony Brook took over. Seton Hall took six shots in the first half to Stony Brook’s four, but by the end of the game, the Seawolves outshot the Pirates 7-1 in the second half and had an 11-7 advantage for the overall game. The Pirates were able to cross the midfield threshold of the Seawolves on several occasions in the second half, but could do nothing against the Seawolves defense. This was something Stony Brook head coach Ryan Anatol knew coming out of halftime. Stony Brook put up a similar dominant second half performance to their match-up against Canisius. After suffering a shutout loss to Army, the team was pleased to get a shutout win of their own. The Seawolves will have five days of rest before completing their four-game homestand in a match-up with the Central Connecticut State Blue Devils. That game kicks off on Wednesday, Sept. 6 at 7 p.m.